Offensive line coach Sam Pittman said his philosophy is that if it’s a close call between a freshman and a veteran, he’ll usually go with the freshman, because they figure experience eventually will make him better. He’s the bizarro Willie Martinez! There’s an appealing logic just to that thinking, but even more so, consider the continued pressure that puts on upperclassmen not to rely on coaching inertia to keep their spot on the two-deep. I think I like this Pittman guy. … was convincing the world that a YouTube video of a student-athlete throwing a football on the beach with his girlfriend was an NCAA violation. That revelation prompted two quick thoughts from me. That all came back to me when I saw this post yesterday from Jake Rowe outlining the justification for making Kirby Smart the third-highest paid head coach in the Southeastern Conference. That’s no little thing, either. He’s also one of just two coaches in the conference to lead their team to the College Football Playoff final. Fisher, while at FSU, and Malzahn led their teams to the National Championship game in 2013, but that didn’t require conference championships and first-round playoff wins to get there. Fisher led the Seminoles to the first ever College Football Playoff but they were knocked off in round one against Oregon. Smart and Saban are the only two. Malzahn has an SEC title and a separate appearance in the game to his credit. While Mullen did a tremendous job at Mississippi State and took the Bulldogs to heights previously unknown within that program, he hasn’t yet led his team as far up the mountain as Smart did in just 24 months. With all due respect to Pruitt and Stoops, I think most would agree that it’s a little silly that, as of right now, both are set to make more than Smart in 2018. Stoops, like Mullen at MSU, is consistently doing things at Kentucky that few have but he’s 0-2 against Smart coached teams and hasn’t really challenged for a division title. Pruitt hasn’t yet coached in his first game as a head coach. At the very least Smart should and, almost certainly will, jump those two. But should he A) stay behind Mullen and Malzahn B) fall between them or C) become the conference’s third highest paid coach? I get what he’s attempting there, but it’s irrelevant to what McGarity is facing. First of all, to the extent you’re making the argument that an existing set of coaching accomplishments on the field sets a future salary, that’s actually something that’s been addressed, at least in Smart’s case, with the bonuses structured in his existing contract. It’s the same dynamic in play in Athens. McGarity may be happy Richt is gone, but I bet he’s a little nostalgic over how little pressure Richt usually gave him on the contract front. Not now. Jimmy Sexton — hey, what a coincidence! — may politely mention 13 wins, an SEC championship, a berth in the CFP, etc., but what he won’t have to say is “you don’t want to think about me exploring Kirby’s options elsewhere” because he already knows that’s in the head of every soul in Butts-Mehre. That’s what’s going to drive the number that will be inserted into the contract extension. Kirby’s the one holding the cards. That’s why it really doesn’t matter what Gus is getting paid. McGarity will agree to something that’s not based on what Dan Mullen’s done, but on what he fears some other heavyweight program might believe Kirby is worth. I sense a crisis is in the making. On the surface, the good times continue to roll for the SEC. After total SEC revenue soared past the half-billion dollar mark for the first time in 2015-16 to $565.9 million, the conference announced Thursday that it is splitting $573.8 million among its 14 member schools. That comes out to a few dollars under $41 million per school ($40.986 million), up slightly from $40.4 million per school the year before. The revenue distribution does not count a total of $23.1 million retained by SEC schools that played in bowl games after the 2016 season. Dig a little deeper, though, and you’ll see the key word in that quote isn’t directional. It’s “slightly”. SEC revenue distribution took an enormous leap upward after the debut of the SEC Network in August 2014. The 2015 calendar year was the first full year for the network, taking each school’s SEC revenue from $20.9 million for the 2013-14 to $32.7 million per school for 2014-15 and $40.4 million last year. When you’re used to seeing multi-million dollar bumps in revenue year-over-year, a few hundred thousand ain’t gonna feel the same. Not even close. No, sir, not when you’ve got ever-enlarging coaching contract terms (with their attendant buyouts, heh), facilities arms races and the general ego trip with the Big Ten over which conference’s financial Johnson’s bigger to handle. Rabalais writes, “Such huge gains probably could not be expected again this year. Still, SEC revenue distribution has increased every year since 1980”, which sounds like a sound bite tailored perfectly for Greg Sankey’s use, but I have a hard time believing it’s going to mollify school presidents over the long haul. Which means… well, if you’ve followed SEC football long enough, you probably know exactly what it means. This doesn’t strike me as good news for the sport’s future. 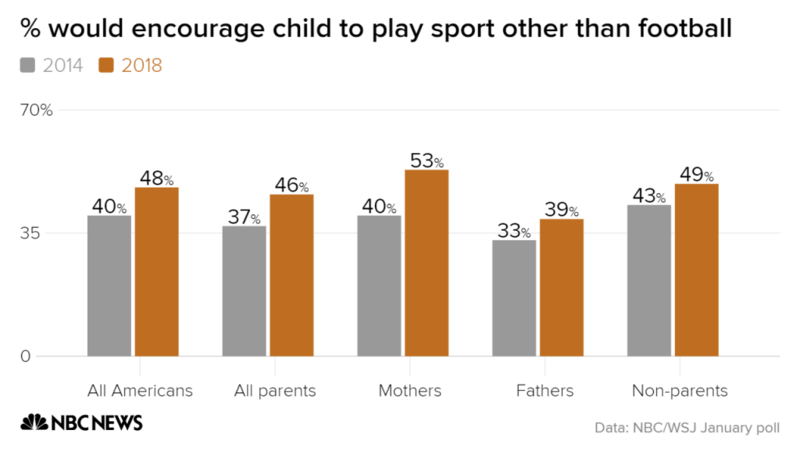 Just days before the Super Bowl, 48 percent of Americans say they’d encourage a child who wanted to play football to play a different sport due to concerns about concussions — up 8 points since the same question was asked four years ago, according to the latest national NBC News/Wall Street Journal poll. That includes 46 percent of parents with a child in the household (up 9 points since 2014), 53 percent of mothers (up 13 points) and 39 percent of fathers (up 6 points). If you want a picture painted, here you go. That’s not a subtle change over a four-year period. And there really isn’t anything going on in the present to re-direct the direction of that trend. Schools and the NCAA are currently reacting — if you want to be generous with a description — to litigation threats, but longer term, what happens to the sport if the talent pool begins drying up because more and more parents refuse to let their kids play? Do you think anyone on the collegiate level has even begun seriously considering the possibility? The more I read about Phil Fulmer’s level of involvement in the UT football program, the weirder it seems. Fulmer took the unusual-for-an-athletic-director step of getting NCAA-certified to recruit on the road during Pruitt’s two-jobs-in-two-cities period, and he even went on the road with Pruitt a couple of times. And he claimed to love every bit of what he saw. Fulmer knew about Pruitt’s reputation as an elite recruiter. He got excited when watching Pruitt get up “on the edge of his chair” with a “nervous twitch in his leg” when the two talked recruiting during the interview process. Jeez, guys. Get a room, would ‘ya? ESPN sez good times are coming. ESPN looks at the numbers and sees a lot of things coming up roses for Georgia in 2018. It looks like it’s okay to be a little excited.